Early in 1998 Elder Bruce C. Hafen of the Seventy, then a member of the Australia/New Zealand Area Presidency, visited Toowoomba, Queensland, Australia. Toowoomba, nestled in the mountains 75 miles (120 km) west of Brisbane, is the home of the University of Southern Queensland (USQ). “None,” replied President Pitman. At that time, the very concept of a university ward in Australia was a novelty. While there are many universities in Australia with Church institute programs, nowhere in the nation was there a Church unit affiliated with a university. When President Pitman explained there were only a few Latter-day Saint students at USQ, Elder Hafen encouraged President Pitman to consider forming a university branch as an ideal opportunity for growth. In February 1998 the Toowoomba University Branch was organized, the first university-based Church unit in Australia. The growth promised by Elder Hafen began to occur as branch members shared the gospel with their friends and classmates, many of whom joined the Church. Attracted by the university branch, more Latter-day Saint students came to study at USQ. By the time the university opened for its 2001 year last February, the little branch had grown to some 60 members. Located near the eastern coast of Australia, USQ draws many students from other Pacific areas as well as Australia. The international makeup of students is reflected in the Toowoomba University Branch. The branch provides a spiritual haven for its diverse group of members, no matter where they are from or whether they are new converts, recently activated members, or lifelong Latter-day Saints. Ashley Auld is a student who began attending the branch at the invitation of two sister missionaries. Touched by the warm welcome he received and the sincerity of the testimonies he heard there, Ashley was soon baptized. He was ordained an elder and now serves as a stake missionary. Branch member John Hartzenberg of South Africa was less active when he arrived at the university. But after missionaries taught and baptized his wife, Nadja, John became an active member. Their young son, Kyle, now enjoys the benefits of Primary. Linette McNab, a Latter-day Saint from nearby Ipswich, had planned to be at the university for only a month but enjoyed the university branch so much that she decided to stay. “Now my younger sister wants to come here next year as well,” says Linette. 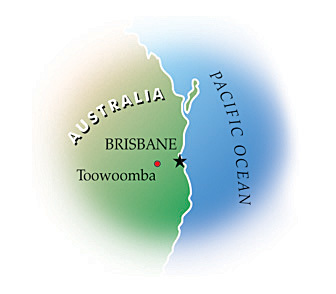 Toowoomba, a 90-minute drive from Brisbane on the coast, is the principal inland city of Queensland.